I found her when I wasn’t looking. “Where are you from?” I asked. “Lots of different places,” she replied. She was mimicking Christopher Lambert’s response, and indeterminately European accent, from the film Highlander. I didn’t get the joke, but I somehow managed to get her number that night. A few months after we met, we moved in together. One evening, as we walked home from a curry house, slightly drunk, I found the perfect pair of spectacle frames – black, square and narrow – looking up at me from the pavement with its arms folded back. I had my prescription fitted and wore those glasses until the sweat of successive summers turned the plastic a whitish grey. By that time we’d moved to a nicer part of town and I’d got a better job, through which I received an invitation to visit Belgium; a place called Zolder was on the itinerary. I accepted on a whim and saw Mario Cipollini become world champion. I never asked to be skinny or fit, but that’s what happened not long after. These incidents that have shaped and defined parts of my identity happened by accident. So by the time I decided to find a bike that would last me many years, I knew the sensible procedure of establishing performance criteria and comparing the aesthetics of various components wasn’t going to happen. To put it simply, I never chose my bike; I gave in to chance and let the bike choose me. The first time I saw it was on a deluged club run in the spring of 2003. The owner, one of only five members who had braved the downpour, was taking the bike out for its debut ride. He disappeared up the first hill and that was the last we saw of him that day. Three years later, I bought that bike in its essence: frame (Merlin Cyrene), fork (Reynolds Ouzo Pro) and a Royce bottom bracket. I had no idea how I wanted to complete the bike. Why did I end up choosing Ksyrium SLs? Because I knew someone who had inadvertently tested their durability by crashing into a tree (the front wheel, and the rider, survived more or less intact). Chorus for the groupset, because Record felt like an extravagance. I left it to a mechanic friend to decide the rest and build up the bike for me. If you want to know whether or not your bike is truly suited to you, then sleep with it by your bed. Go to sleep late, wake up too early, and look at it as soon as you get up. Does it make you want to ride, even if your body is telling you not to bother? Then congratulations, you have chosen a great bicycle. For years I kept the Merlin next to our bed (yes, our bed – I managed to keep the girl) alongside an aluminium Merckx and a stickerless steel Glider, and it still inspires me to ride more than its two companions. Gleaming, naked titanium, white bar tape and white Fizik Aliante saddle: it looks indomitable, enduring, immortal, even though I’m no Christopher Lambert. 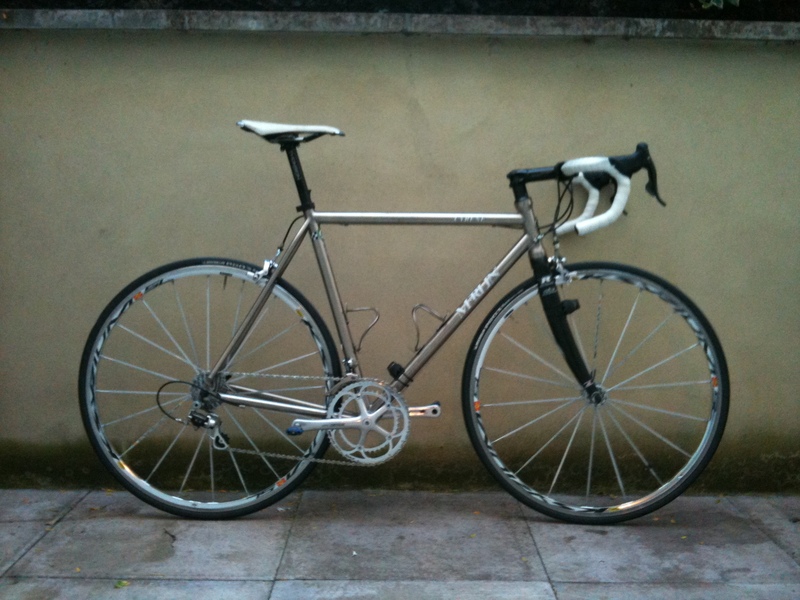 The chunkier and more functional Campag gets, the more elegant my 2006 cranks look. And the Ksyriums, originally chosen out of practicality, please me with the simplicity of their thick spokes; when a child draws a pair of bicycle wheels, they draw SLs or something like them. Performance-wise, it rides smoothly with just enough bite to get me over the sharpest bits of the Monte Grappa, the Barbotto or the Bwlch. But above all, what I like most about it is its arbitrary nature: an American frame, an Italian groupset, conjured into being through serendipity and indecision, via a workshop in Surrey. A bike from lots of different places. This entry was posted on	February 14, 2013 at 3:30 am	and is filed under Uncategorized.